Rumor has it astrophysicists might have detected gravitational waves from a new source. Time to keep a close eye on the LIGO announcement schedule, folks, because if rumors are to be believed, we might be in for a big gravitational wave announcement very soon. At this stage, we’re in the realm of speculation – nothing has been officially confirmed or denied. But there are pretty exciting hints out there that, for the first time, astrophysicists might have detected gravitational waves from a new source: merging neutron stars. Right now, a range of optical telescopes including the Hubble Space Telescope are said to be following up the discovery, which, if confirmed, could greatly expand our understanding of gravitational waves and the dramatic events that create them. For those who need a refresher, gravitational waves were first discovered by scientists at LIGO back in 2015, 100 years after Einstein first predicted them. The waves are ripples in space-time that are produced by the most explosive events in the Universe, and being able to detect them gave us an entirely new way to study the Universe. Just think of it like suddenly being given an whole new sense in addition to sight, smell, hearing, taste, and touch, with which to explore the world. Epic, right? The first gravitational waves we picked up were produced when two black holes collided around 1.3 billion years ago. Since then, LIGO has detected gravitational waves twice more, both times also from distant colliding black holes. The observatory has more recently partnered with a second experiment in Europe, known as VIRGO, to cast a wider net, and these latest rumours suggest that collaboration has paid off. So back to the latest speculation. It all started with a series of tweets from University of Texas astrophysicist J Craig Wheeler. “Rumor of exciting new LIGO source,” he wrote back on August 16. 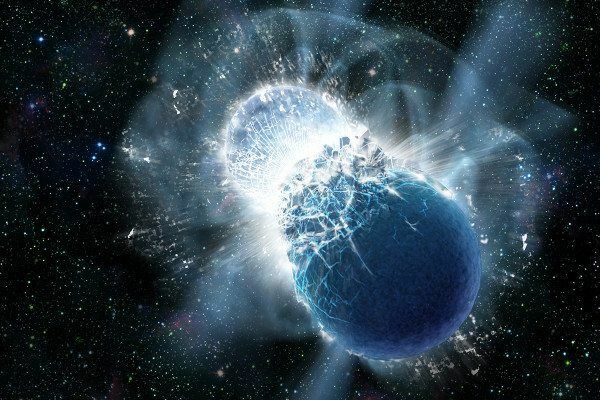 That optical counterpart he mentions is what’s really exciting, because it suggests the gravitational waves were produced by merging neutron stars – stars that are created when giant supernovae collapse in on themselves. Image Credit: Dana Berry/Skyworks Digital, Inc. The tweet was picked up by Mika McKinnon over at New Scientist, who discovered that a range of optical telescopes had since turned their focus to a galaxy known as NGC 4993, which is around 130 million light-years away. According to Ethan Siegel over at Forbes, just four days after Wheeler’s tweet, Hubble spotted a binary neutron star merger candidate in the galaxy. To add fuel to the fire, astronomers were being pretty cagey about what they were studying. So why would neutron star gravitational waves be so exciting, if we have detected them? Siegel has a brilliant breakdown of how these gravitational waves might be different to those from black hole collisions, which you should definitely check out. Aside from the fact that they’d come with accompanying optical counterparts, they should also be lower in amplitude and occur over longer periods, he explains. Also, they would require a lot more sensitivity to pick up. “We need to be roughly ten times closer to get the same amplitude signal that we’ve seen from black holes,” writes Siegel. When questioned by McKinnon, LIGO spokesperson David Shoemaker didn’t confirm or deny the rumours, only saying: “A very exciting O2 Observing run is drawing to a close August 25. We look forward to posting a top-level update at that time. Wheeler’s tweet has since drawn backlash about whether he should have spilled clues about the discovery before LIGO and VIRGO were ready to make the announcement, and he’s now apologised. Right or wrong, I should not have sent that tweet. LIGO deserves to announce when they deem appropriate. Mea culpa. But there’s no putting the cat back in the proverbial bag, and although we’re waiting until the find is verified before we get too ahead of ourselves, we’re definitely excited for LIGO and VIRGO’s official announcement. We’ll keep you updated as soon as we learn more.